Milk - The truth about food and medicines. Not so long ago dairy products, and milk in particular were shunned until medical evidence proved that far from being suspect, they were protective foods as the McCarrison Society for Nutrition and Health has always known, with a valuable part to play in the diet. In a study carried out on men in Wales, the result of which was published in the Journal of Epidemiology and Community Health (October 2004) 2,375 men were tracked for 20 years. It revealed that those who drank a pint of full fat milk and ate cheese and yoghurt cut their risk of heart disease and strokes by two thirds. Why milk should ever have come under suspicion is puzzling, as many people will remember how milk ws once considered so important for healthy bones and teeth that free milk was issued to all school children. Today, interest in good food has never been greater. Discerning people are questioning where their food comes from, and most of all how it is produced. The tide is now turning towards raw (unpasteurised) milk and its protective properties. Of course these days, because of changing farming practices, it is of prime importance to ensure that the milk comes from grass fed cows rather than from cows whose diet is mainly cereal, as this type of cattle food changes the metabolism of the cow and is thought to alter the quality and health benefits of the milk. There is no doubt that heat treatment, as in pasteurisation, is detrimental to health. It denatures the milk and alters the configuration of the milk proteins. Evidence shows that raw milk has a higher nutritional value providing more available vitamins and minerals than pasteurised milk. It contains anti-infective agents that can both restrict the growth of contaminating bacteria in the milk and give the consumer protection. It also has a better flavour with none of the deterioration in quality caused by heat treatment. Pasteurisation, in its day, did have a very important part to play. One hundred years ago dairies were often unhygienic and there was much more risk of milk becoming contaminated, but nowadays hygiene in the majority of dairies is extremely good. Nevertheless, there is still the problem of milk becoming contaminated after pasteurisation. Once milk has been pasteurised or otherwise heat-treated, the ability to restrict bacterial growth is lost or severely curtailed. The enzymes and other anti-infective agents are destroyed to varying degrees. This means that bacteria contaminating milk after pasteurisation from, for example, the filling machines, the air or even from under the bottle cap, can grow more rapidly than they would in raw milk. As a result of pasteurisation there is approximately a 10% loss of vitamins B1, B6, B12 and folate and a 25% loss of vitamin C. Greater losses of vitamins occur with more severe heat treatment. One group of bacteria called thermodurics can survive pasteurisation. The numbers present in bottled milk can vary quite widely and the presence of those, which grow well at low temperatures, affects the shelf life of the pasteurised product. Laboratory studies have shown that when cow’s milk is pasteurised, a germinant for certain bacterial spores can be produced. Raw milk, on the other hand, contains anti-microbial agents, which function after its ingestion and it also has components which inhibit the proliferation of bacteria before it is consumed. If raw milk is of high microbiological quality, it is obviously not the breeding ground for bacteria that some people would have us believe. Fears about the risk of many diseases once associated with raw milk are now largely unfounded. By the end of the 1960’s tuberculosis, typhoid fever, paratyphoid fever, bacillary dysentery, scarlet fever and staphylococcal intoxication conveyed by milk had disappeared, and brucellosis had declined. From 1951-1960 there were 3 cases of T.B. ( no deaths) attributed to raw milk and in the subsequent 20 years (1961-1980) no deaths at all even though there were over 7,000 deaths from T.B. from other causes between 1972 and 1981. The risk of infection from raw milk has become very small despite the fact that cases of food poisoning generally have increased over the years. These outbreaks are very often due not to the producer but as a result of unhygienic conditions or mishandling in the home. No doubt most dairy farmers and their families drink the milk raw before the bulk of it is pasteurised, yet to my knowledge there has never been an outbreak of disease among the farming community as a result. A sensible approach to hygiene is obviously necessary. Human beings were never designed to eat sterile food, but a reasonable degree of cleanliness is to be desired together with the promotion of vigorous good health and the associated resistance to disease, which comes from eating natural, wholesome foods, which have not been unnecessarily processed, as Sir Robert McCarrison himself strongly advocated. Recently, a dairy farmer was interviewed on one of the BBC farming programmes. He confirmed that there is now an increasing demand for unpasteurised milk. Regulations mean that only the dairy farmer himself can deliver milk to his customers but this particular farmer had seen his number of customers grow to 300 in just eighteen months. His cows are regularly inspected for cleanliness, the milk being tested daily and cooled rapidly in the dairy. The farmer remarked wryly, that only two things carried a health warning, cigarettes and raw milk! He added that for him, there was nothing like a glass of raw milk at bedtime to help him sleep. Intolerance to lactose is often because an important enzyme is missing in pasteurised milk and could be responsible for asthma and eczema in children. Others claim that diseases such as brittle bones and osteoporosis are as a result of pasteurisation. For some unaccountable reason raw milk is banned in Scotland even though there is no law against it in other European countries. It is heartening to find a list on the Internet of the many dairy farmers in England and Wales who are fully licensed and willing to sell raw milk either direct from the farm or at local markets and farmers’ markets up and down the country. This is obviously as a result of a growing demand but consumers must always ascertain that the milk is from cows that are grass fed. One of the biggest problems is the importation of milk into the UK from countries in the EU. In 2008 records show that 134.1 million litres of milk was imported into the UK either as raw milk for processing by dairies in the UK, or as liquid drinking milk, e.g. pasteurised or UHT milk. 41.3 million litres of raw milk and 54.4 million litres of liquid milk came from the Irish Republic and the rest from Belgium, the Netherlands, France, Germany and other EU countries. Many farmers, fed up with what they consider unfair legislation and the pressure put on them by the supermarkets, are taking matters into their own hands. In Italy, farmers are promoting the sale of raw, fresh milk direct to the public. In Turin, a local dairy farmer delivers his cows’ milk every morning where it is pumped into a refrigerated container. 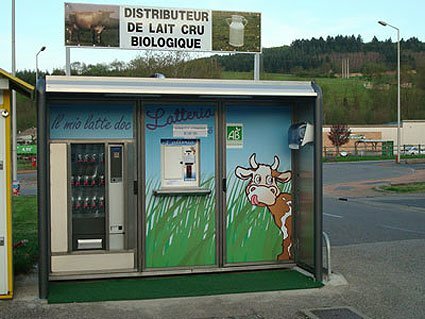 Customers either bring their own bottle or buy a new one and fill it up with a litre of fresh raw milk for just one Euro! 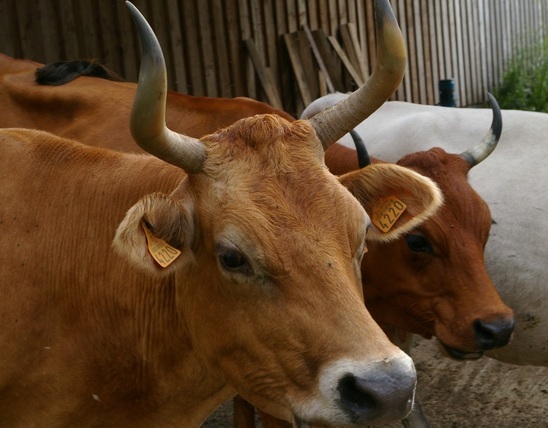 There are now 1316 raw milk vending machines in 91 provinces in operation in Italy alone. Other countries such as France, Croatia, Switzerland, Austria, and the Netherlands also report vigorous sales from these machines. Farmers in the UK should take a tip from these European countries and do the same; sell their milk direct to the customer, thereby ensuring a fair price for their product. PASTEURISATION PURELY FOR ECONOMIC REASONS. One of the reasons why milk is pasteurised is because it enables dairy corporations to control the milk supply and of course, it gives the milk a longer shelf life which is of benefit to the supermarkets that can pin down the farmers to the lowest price, a price that is often not even enough for them to make a decent living and cover their production costs. The risk is that farmers will be forced out of business and we shall then have to rely on milk imported from other countries where standards of hygiene and animal husbandry may not be as good. In the UK we have some of finest pastures for milk production in Europe but once we have lost our dairy farmers there will be no going back. Despite changing fads, whole milk from grass fed cows is, and always has been, a nutritious food and a valuable source of essential fat soluble vitamins especially for growing children and for the normal development of the brain. Don’t let any ‘experts’ try to tell you otherwise! Milk is heated while under pressure to a temperature above 72°C (161°F) for 15 seconds. This allows for a longer shipping time, a longer shelf life and can also allow unscrupulous farmers to become lax over hygiene. This process holds milk at a temperature of 138°C (225°F) for a fraction of a second. The treated milk can then last 2 to 3 months when refrigerated. The natural fat is broken up into smaller sizes so that it no longer separates from the milk. The milk is forced at high pressure through small orifices. The aim is to prevent or delay the natural separation of cream, which normally collects at the top, from the rest of the emulsion. This process is considered dangerous because the milk can then pass directly into the bloodstream, by-passing normal digestion in the intestine. Skimmed milk has had the fat soluble vitamins A and E removed. Vitamin D, important for bone health, is also removed in skimmed milk. Unless there is an assurance of an adequate intake of these vitamins from fresh vegetables rich in vitamin A or carotene, notably carrots, or from liver or cod liver oil, many people will be missing out on these essentials vitamins. Osteoporosis is responsible for around one million bone fractures in Britain annually, particularly among older women. According to the National Osteoporosis Society, almost 3 million people in the UK are estimated to have osteoporosis. The combined cost of hospital and social care for patients with a hip fracture amounts to more than £2.3 BILLION per year, equivalent to £6 million per day. Because of its calcium content, an increase in milk consumption has been recommended, especially for post-menopausal women. Milk provides about 65 per cent of calcium in the British diet. In Britain, milk consumption and death rates are inversely correlated. People with low milk consumption have on average higher death rates, including death rates from heart disease and cancer, than people with a high milk consumption.